The Houston Rockets have fallen back to a losing record and I have no idea what to tell you. The Washington Wizards, the laughingstock of the league, forgot their troubles and defeated the Rockets in an overtime game that made exactly zero sense. Everything about this game was as bizarre as the first thing you'd notice about it; James Harden wore a headband. The Rockets hit and shot more threes (18-48 for Houston, 11-29 for Washington) at a nearly identical rate. They took more shots overall (97 vs 88). They grabbed more rebounds (47 vs 38) and didn't trail Washington in either offensive or defensive boards. Houston had a mere 2 fouls more than the Wizards. Washington only shot a few more free throws than Houston, and that's mostly due to the Rockets fouling late in the game. The Rockets led by 17 and the game seemed nearly a wrap as the Wizards looked dysfunctional and spiraling. Then, something happened. I don't know what. But it happened. The Rockets didn't have Chris Paul or Gerald Green available, sure. But Harden and Eric Gordon combined for a staggering 90 points on the evening, both of whom shot over 50%. Harden had 13 assists and 8 rebounds. They still lost. Sure, James gave up the ball 11 times, and that's a nightmare. It also scarcely seems to mitigate all those other factors. 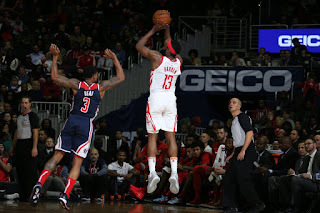 In fact, the only real difference between the teams' performance is that the Rockets were 28-49 on two pointers (57%) while the Wizards went 39-59 (66%). Both of those numbers are ludicrous, and the Wizards' number is just ludicrous-er enough to account for a loss. They both had crazy points in the paint numbers (56 for Houston, 62 for Washington), but that's not enough to account for it. 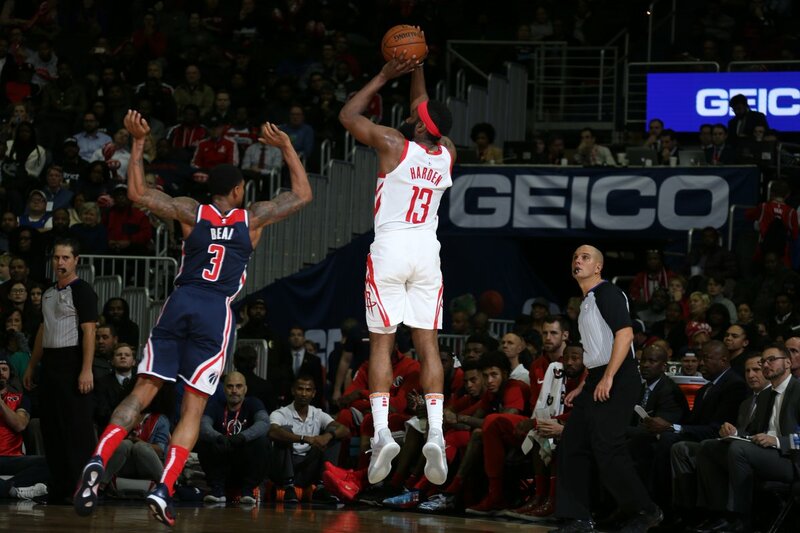 According to NBA.com's stats site, the Wizards boxed the Rockets out 31 times to Houston's 16, which makes absolutely no sense in conjunction with the rebound numbers. Meanwhile the Rockets allegedly contested 51 of Washington's 59 two point attempts and 26 of their 29 three point attempts while Washington contested 33 of Houston's 56 two point tries and 38 of their 48 threes. That totals out to 77 of Washington's 88 shots (87%!) being contested to Houston's 71 out of 97 (73%). What does all of this mean? Does all of this mean anything? Does it literally just come down to 19 turnovers vs 14? I have no idea. I don't know anything at all about this game and I don't think anyone else does either. The Rockets are bad, I guess? And they're bad in some new exciting way that doesn't make any sense whatsoever. Or not. Who knows? Maybe it's the headband's fault.